There are some foods that just fit me like a glove. Foods that mingle up my favorite flavors, all at once, and deliver them in walloping bites. Foods that not everyone loves as much as I do, giving me full license to pretend I’m just more sophisticated than they are (all the while stuffing whatever’s left into my greedy maw). Olive tapenade is one of those foods. I never met a salty briny thing I didn’t like, and tapenade’s got a trifecta of them: olives, capers, and anchovy. Mashed or blended with a healthy punch of raw garlic and a glug of olive oil, these three make one of the most weirdly compelling foodstuffs I’ve ever met. A good tapenade is salty but not withering, spicy and nose-tickling from the garlic and gardeny-fragrant from olive oil and herbs. Slather some on a piece of crusty bread, and I’m powerless to resist. Dollop some on fish or stuff it under the skin of a chicken, and I swoon. Use it as a salad dressing or pasta sauce, and I’ll be over at your house before the plate hits the table. This particular tapenade started with a pack of oil-cured olives I found in my boyfriend’s fridge. Oil-cured olives are particularly powerful things–ugly as sin, to be sure, all black and wrinkled and greasy, but with an incredible salty wallop and lovely oily finish. They’re far too gutsy to use on their own in a tapenade, which is why I jumped at a recipe that called for a mix of olives and dried figs. The combination of funky-sweet fig and salty-sharp olive, with the potency of garlic and the deep savor of anchovy, is absolutely phenomenal. I ate it on bread until the bread was gone, and then scraped out the bowl with a spoon. I think my friends avoided me for the rest of the day, but eh. Their loss. As with pesto, there are several ways to make tapenade. (In a way, I suppose a tapenade is kind of like a pungent olive pesto.) You can chop it finely with a knife, mash it together with a mortar and pestle, or blitz it to pieces in a food processor. 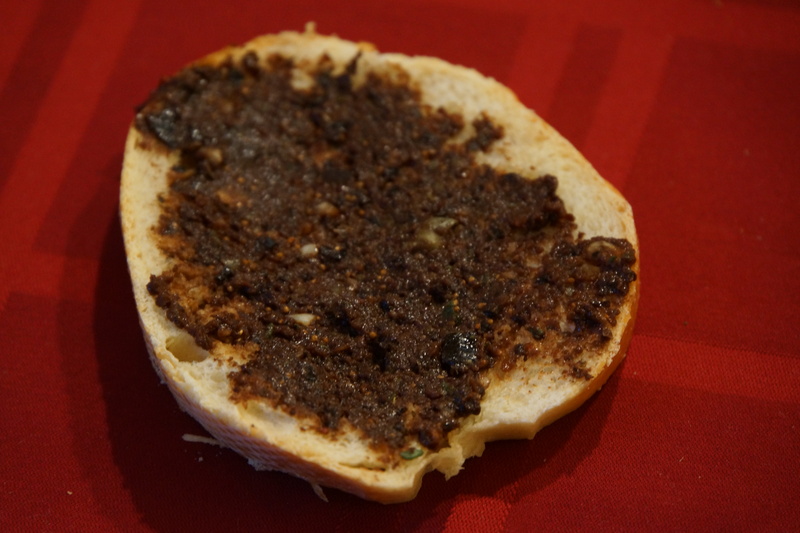 I like my tapenade with a little bit of texture–slightly bumpy, in a way. But it’s a matter of taste, so take it to the consistency that feels right to you. And then hide it from me, or I will eat it all and leave none for you. I’ve been making a version of this frittata for years. And thanks to my friend Elly, I think I’ve finally hacked the technique. It’s not a secret, certainly, that eggs + potatoes + peppers + sausage = phenomenal breakfast. Combine them in a frittata–a sort of chubby omelet or crustless quiche–and you get something deeply comforting and filling for fairly little effort. A frittata can be eaten warm or at room temperature, on a plate or on the go, for any meal of the day. 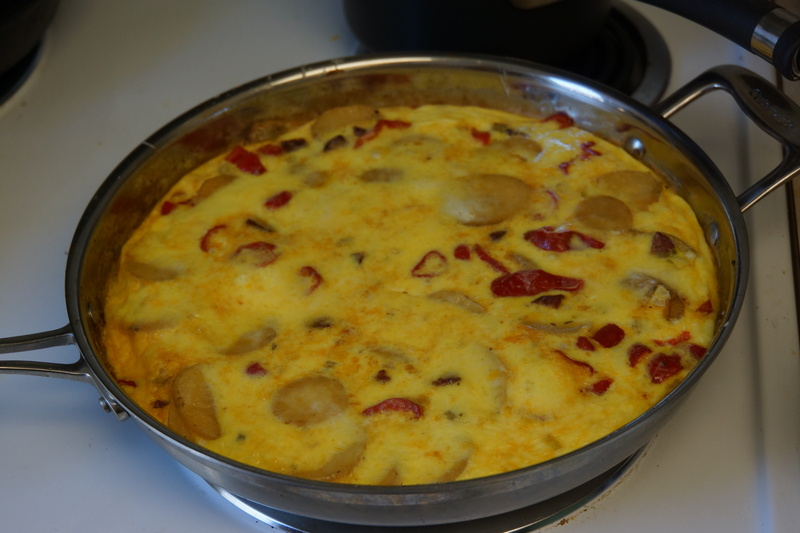 I’ve done the potato-pepper-sausage thing more times than I can count, and it’s still my favorite frittata filling. That said, I’ve had a dicey relationship with frittata for a while. The usual method I used is to cook the filling on the stove, then mix in the eggs and scramble them until they just start to set, then finish the whole thing under the broiler. It makes for a very pretty final product–golden brown on top, solidly firm all the way through–but I just didn’t like the texture. My frittatas always ended up grainy and tough, and the browned top tasted more bitter than delicious. For a long while I stopped making frittatas, because I was tired of laboring over delicious fillings only to wind up choking down a mass of crumbly egg. Enter Elly and her genius technique. Instead of starting the eggs in a hot pan and finishing them under the broiler, she suggested cooking them all the way through in a moderate-hot oven. We went to the farmer’s market for ingredients: firm Spanish chorizo, golden potatoes, curly frying peppers, scallions. I started out the usual way, sauteing everything in an oven-safe skillet on the stove. Then, after sliding the pan off the heat and letting the filling cool for a second, Elly added the eggs and we slid the whole assembly into a 400-degree oven to bake. 15 minutes later, I pulled out a gorgeous golden egg-cake, puffed and set but not at all browned. It was tender and smooth all the way through, and the eggs had gently absorbed the flavors of pepper and potato and onion. That frittata got eaten so fast, I didn’t even have time to photograph the wedges on a plate. With a tangy spinach salad, it made for a glorious Sunday lunch. One note: in order to really pull this off well, your skillet must be both oven-safe and nonstick. I used a stainless steel skillet, and while the frittata did come out with some effort, it left behind a heckuva mess. If you don’t have an appropriate skillet, I’d suggest sauteing the filling first, then finishing the frittata in a generously greased or parchment-lined 9×13 baking dish. The cooking time may be slightly different this way, so keep an eye on it. The raiding of my friend Sarah’s backyard continues. I’m becoming convinced she has every fruit under the sun at her disposal. In addition to the orange and plum and peach trees (and apple and pear trees to come later in the fall), she also has a Concord grapevine in a corner of her backyard. Its a slightly sullen-looking thing, all wrapped around itself in a mound in the middle of a scrubby patch. But the grapes it gives out are incredible. Before I ate grapes in Sarah’s backyard, I’d only ever tasted Concord grapes in jelly and juice. The actual grapes taste a bit like childhood, in that way: rich, round, dark grape flavor, as intense as any grape you’ll ever eat. But they’re not really ideal table grapes, since they have a thick, loose skin and substantial seeds that make you pause to crunch or swallow them. Fortunately, one of our friends tipped me off to Concord grape pie, something I’d never heard of before. Of course I had to try it. I’ll warn you, this is a labor-intensive project. The grapes have to be gently pinched out of their skins, then cooked into a pulp to release the seeds inside, then strained back in with the skins. The whole process wasn’t difficult–especially since our grapes were so ripe, the skins had already split and started to come off by themselves. It was also fun to stand at the stove with a small cauldron of naked green grapes, all translucent and fleshy and rather like alien’s eggs, stirring them until they collapsed into goo. I also made the process a little more complicated by attempting my first-ever lattice top (as you’ll see in the photo, I need practice). My goal was to make sure the filling tasted like grape, not jelly. I kept the sugar at a minimum, and added a touch of orange and nutmeg to make the whole thing a little more grown-up. Judging by the audience reactions, I think I made the right decision. 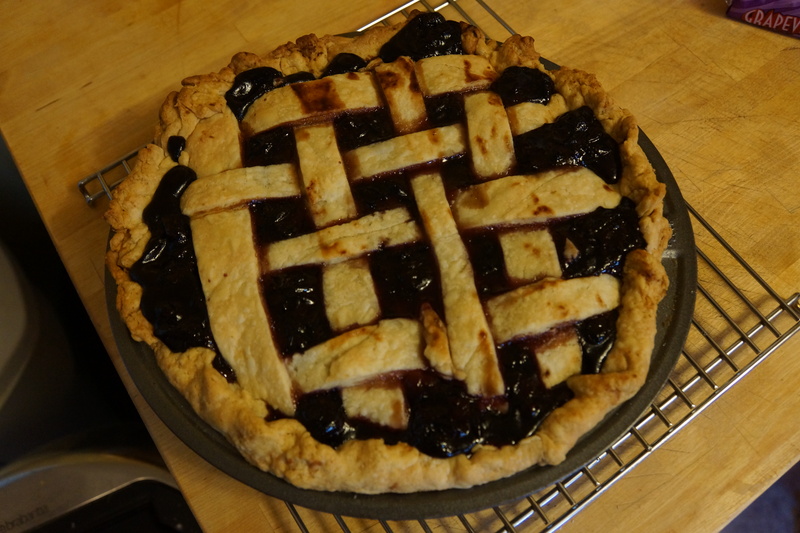 This is the kind of pie that just looks exciting coming out of the oven: thick purple juices bubbling wickedly through the crust, staining the edges of the lattice a pretty wine color. The interior tasted like grape–good old-fashioned childhood grape–but a little more adult, with sweet orange and spicy nutmeg and only a hint of sugariness. The grape skins add a slight raisiny texture here and there, and of course contribute to the remarkable color. I sliced into this warm, which was a mistake; it needs to cool completely so that the filling can really set into the wonderful loose-jelly consistency you want. But once it’s cooled, all bets are off. This is one delicious pie. Once again, it looks like I spoke too soon. No sooner did I finish wailing about the end of summer than we were hit with a heavy heat wave. This weekend was dry and blue and deeply, deceptively hot. So I drank all the icy drinks I could find. Lately Sam and I have been into shrubs. (Not shrubberies. Shrubs.) A shrub is an an alcohol-free cocktail of sorts, built on an old-school mode of preservation: fruit vinegar. We first stumbled across this at the Oregon Berry Festival, where there was a stand selling deeply colored syrups and mixing tiny sample drinks for passers-by. A cheerful, motherly woman poured a few drops into a paper cup from a bottle labeled “drinking vinegar,” added some sparkling water and a tiny ice cube, and handed it over. We tasted, and we believed. I know this sounds strange–every time I say the words “drinking vinegar,” people wrinkle their noses and hunch up their shoulders. So don’t think of it as vinegar, exactly. Think of it as “shrub syrup,” a tangy-sweet potion of fruit and vinegar and sugar, to be drizzled into a glass of cold fizzy water and enjoyed over ice. A good shrub is tart but not biting, with a solid hum of fruit and just enough sweetness to cut the acid from the bubbles. You can easily vary the sourness of the drink by adding more or less syrup, as you see fit. This particular syrup came about more or less by accident. 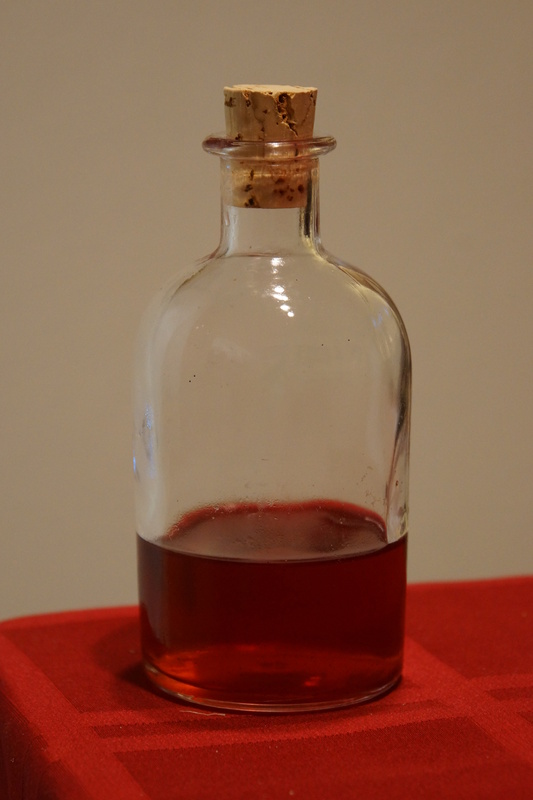 It started out as a straightforward infused vinegar, and a leftover use-up: I had the pits and dregs from a bag of cherries, and the remnants of a bunch of tarragon. So I combined them in a bowl, poured over some hot vinegar, and let them steep for a couple hours. The resulting vinegar was lovely and fragrant, but extremely subtle; I tried using it in salad dressings, but none of the cherry flavor came through. So I decided to mix in some sugar and turn it into a shrub syrup. It was a wonderful decision. A tablespoon of this syrup, stirred into a glass of iced fizzy water, makes a shrub that is light, sweet and aromatic. There’s a whisper of cherry and a hint of licorice, and the whole glass is tinted a very pale pink. There’s a touch of vinegar-tang, but really, it just tastes like a slightly upscale Italian soda. It was the perfect thing to sip under an open window with a fan on full blast. You guys. I had to turn on the defroster in my car this morning. Summer is officially over. I’m in pretty deep denial about this. Normally, by September I’m ready for knits and scarves and soup. But this year blew by so goldurned fast, I feel like summer only just started. I didn’t get nearly enough of the sticky blue heat and bright evenings and lemonade. I’ve worn a swimsuit exactly once since New Year’s. I want to stomp my feet and say it’s not faaaaaaiiiiiiiirrrrrrrrrr. But really, there’s nothing I can do. Time is slippery, and the weather’s already cooling off. But at least there are still tomatoes. Oh, are there tomatoes. Bushels of red at the market, and I couldn’t be happier. Even though I can’t appreciate a raw summer tomato, just the fact that it exists is comforting to me. As long as the tomatoes are juicy and fragrant, I can still hold on to a little bit of summer. When they turn mealy and inert, I know I have to finally come in from the cold. 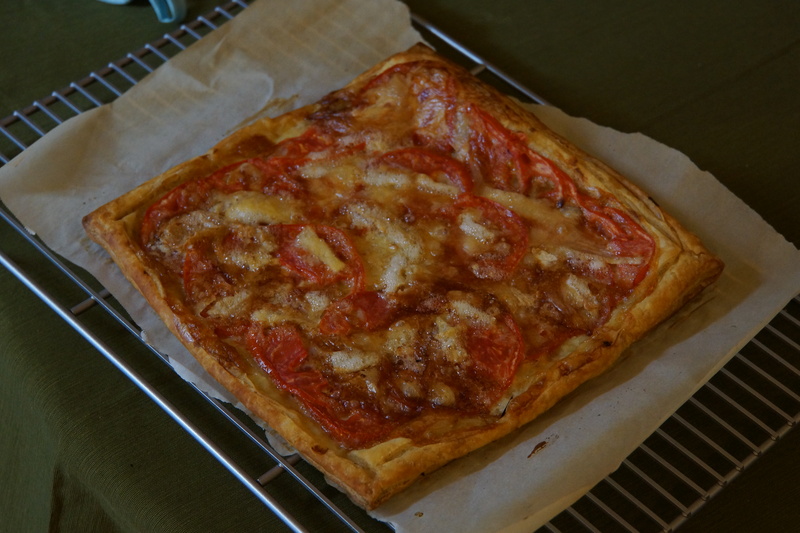 So here’s a compromise: an end-of-summer tomato tart. Puff pastry, brushed with mustard, sprinkled with thyme, topped with tomatoes, and covered with dabs of Brie. I used an extra-soft and stubbornly melty cheese; the liquid edges ran thin over the tomatoes and caramelized in the oven into a shattering cheesy crust, while the larger pieces stayed molten and oozy. It’s basically cheating, this tart: combine puff pastry, ripe tomatoes, and Brie, and you’re guaranteed a winner. But then add the winey bite of Dijon and the resiny fragrance of thyme, and suddenly you’ve got something sophisticated enough for company yet satisfying enough for a snack. This thing is absurdly quick to put together, and can go from oven to table in about half an hour. I’ve made two in the past week: one for three friends sipping tea in the afternoon, one for a party with beer and wine and ridiculous costumes. Both times, it was devoured within minutes. I’ve had it warm and at room temperature, and it’s phenomenal both ways. As a consolation prize for losing summer, it’s pretty unbeatable. It’s two years to the day since I moved into this apartment. Two years. And I only just found out we have a peach tree. A couple weeks ago, my landlord knocked down an old fence in the backyard, and there it was. Not a big tree, and maybe a little scrawny, but baubled like a Christmas tree with small yellow peaches. My neighbor Jess and I greedily picked as many as we could reach, and squirreled them away. I ate a fair number of them standing over the sink, but then this blog post popped up in my email. So I made baked peaches. And oh my goodness. These were easily my dream summer dessert. 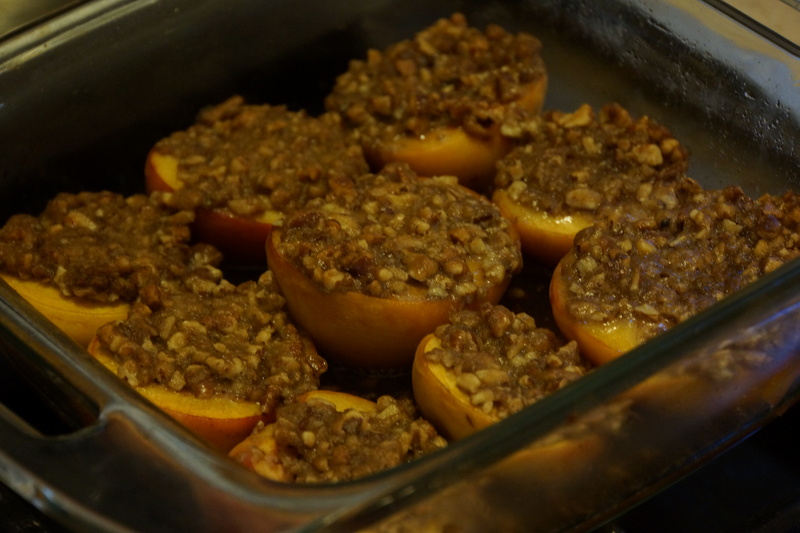 For starters, the simplicity is stunning: pitted peaches, topped with a crumbly mix of nuts and brown sugar and butter, baked until they’re soft and caramelized. The only real work involved is pitting peaches and chopping nuts. No peeling, no dicing, no flour, no oats. But even beyond that, this is one of those odd alchemical recipes whose ingredients turn into something more than their sum. The peaches become tender but hold onto their skins, and the sugar-bound nuts give the flesh of the fruit a deep resinous sweetness. Each peach half is its own self-contained portion, just intense enough and sweet enough to satisfy. We ate our peaches with plain Greek yogurt, which was just about perfect: a shock of dairy coolness against the hot sweet fruit and crumbly nuts. You could easily do this with nectarines instead of peaches; choosing freestone fruits will make pitting and halving much easier. The most important thing is color: use yellow peaches or nectarines, not white ones. You want that faint sourness and light pucker from the yellow fruit, to balance the treacly sugar and fatty nuts. Plus, the yellow flesh looks heartbreakingly pretty in the pan.